It may come as something of a surprise to many to learn that we are currently in the midst of what is called the ‘Sixth Extinction’ – that is, the sixth wave of mass extinctions of plant and animal species since the demise of the dinosaurs some 65 million years ago. Noted conservation scientist David Wilcove estimates that there are between 14,000 and 35,000 endangered species in the United States alone, which represents 7-18 % of all US flora and fauna. What is patently clear is that thousands of species of plant and animal will disappear forever from the face of the Earth in the coming decades. Perhaps one of the most striking elements of the present extinction crisis is the fact that the majority of our closest relatives, the primates, are severely endangered. This is the group that includes monkeys, lemurs and apes (as well as humans) and many are fast disappearing. In addition to the primates, marine mammals including several species of whales, dolphins, and porpoises are among those mammals slipping quickly toward extinction. It is notable that the latter mammalian group – whales and dolphins – have inhabited the planet for just over 50 million years, and in that time they have successfully populated all of the major oceans of the world as apex species. Mankind, by comparison, boasts a heritage of a mere 2.5 million years, yet despite their relatively short tenure they have caused a level of destruction and imbalance which has culminated in the first planetary mass extinction event brought about by a native species. For all of our supposed intellect and sophistication, what is it that we are missing with respect to how we interact with our natural environment? Put another way, what are whales doing right, that we’re doing wrong? Is the simple fact of the matter that there are just too many of us for the planet to sustain? Land clearing for cattle grazing remains the largest contributor to the wholesale destruction of natural habitats. Overfishing and the high attendant level of by-catch wastage are causing the collapse of fish stocks across the world’s major fishing grounds. Our lax attitudes toward effluent and pollution also play a major role. Steadily increasing demand for water, the damming of rivers throughout the world and the dumping and accumulation of various pollutants have made aquatic ecosystems some of the most threatened on the planet. 21% of the planet’s fish species evaluated were deemed at risk of extinction by the IUCN in 2010, including more than a third of sharks and rays. It appears there are two factors in operation here – firstly the natural pressure on the planet caused by sheer population numbers, and secondly our collective attitudes toward our planetary ‘footprint’; the impact our activity has on the environment. For many years I have championed the causes of animal rights and environmental protection, and I can observe in both arenas that there is always a common element of human superiority coming into play. By and large, we still hold to the view that the planet and its non-human co-habitants are limitless resources put there for our use. We naturally resist changes to lifestyle, energy, dietary and consumer patterns when confronted with the notion that those natural resources are threatened or under strain. And often the moves to make change are stymied by the actions of government and big business who have a vested interest in things remaining as they are. Having authored reports on localized decline of small whale and dolphin species in Japanese waters, and having documented the dolphin captivity industry, my recently published work ‘Home’ is my first foray into the field of literary fiction as a vehicle for delivering a message. And just like the story itself, the writing of it came with a twist. When I found myself in confinement in an immigration detention centre, I never in my wildest dreams imagined that I would personally experience all the cruelties of captivity which I had spoken out against so passionately. I was detained in one of Australia’s cruellest gulags – Christmas Island. The name is deceptive and there was little cause for celebration or festivity in what is the equivalent of a maximum security prison, set into a lush ancient forest on a remote island in the Indian Ocean. There was no possibility of seeing my wife or my family, and I lived daily amongst people broken by misery and despair. Many had lived there for years, in a prison with no definable release date. ‘Home’ is based on real events. Research has always been a primary consideration for my work, and ‘Home’ is no different in that respect. One of the greatest challenges in writing and researching was the difficult conditions under which I worked. Computer and internet access was limited and I was forced to rely on the good old ‘analogue’ method of pen and paper writing a lot of the time. My wife chided me recently and suggested there was really no need to go to the lengths I did to research captivity! I was routinely searched for contraband and weapons in the detention centre, and this added to the sense of powerlessness and humiliation one experiences in confinement. Yet I took a secret pleasure in the fact that, as far as I was concerned as a writer; my pen was the greatest weapon anyone could ever carry, and it was with me constantly. I like to think I have done some major damage with it, and perhaps Parker might consider giving me a sponsorship deal, or at the very least a new pen to replace my battle-weary old veteran! As you can probably see, despite the paralysing misery of my situation, I never lost my sense of humour or my spirit, and hopefully my writing is imbued with these qualities. So this book has become something of a statement about captivity, written entirely in captivity. You might be forgiven for thinking that this is just another book with a “greenie anti-cap” message. 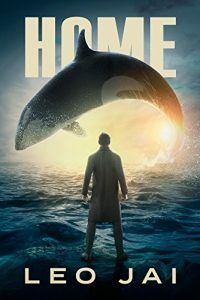 You may be partially correct in this appraisal, however ‘Home’ goes beyond that now familiar ‘Save the whales’ dialogue and touches on a spirituality and a sense of deeper mystery and intrigue that should appeal to a far broader audience. The tale is told from the perspective of Adam Svenson, a man we meet as he is entering prison. At the same time, a parallel tale of the capture of two young orcas is told. We learn that Adam, who has been drawn to the oceans, has been somehow involved in their capture. Steadily the loose weave of connection between man and orca tightens. When Adam is increasingly confronted by visions of a mystic whale, the story takes an unexpected twist and the reader is drawn into an unexpected mystery. ‘Home’ is something of a modern day parable, suggesting some deeper secrets of life and universal harmony, presented in the vehicle of a compelling story of whale and human captivity. It is a book I would recommend not just to those with a ‘green conscience’ or the lovers of animals; but also to the dreamers, the wanderers and the wonderers, and those who simply enjoy a mystery and a good read. So, what are whales doing right, that we’re doing wrong? Read the book and find out…..
‘Home’ by Leo Jai is available in both Paperback and E-Book formats. I don’t need convincing Jai and do not much like fiction, but I admire your fortitude. I wonder where you fled from, what happened to you there, when and why the monsters who imprison people for ever, treating them worse than murderers, let you in to this country, how you have been treated here, how you have publicised what happened to you on that island, what you suggest we can do other than joining Amnesty and going on rallies. Thank you. Yes I see how governments behave, and we all know that their greed exists because voters choose those who promise the most money for them; but one may also suspect that modern medicine without strict contraception and education have led to this looming crisis of over population. In the 1920s Aldous Huxley warned of this, saying that 3.5 million was too many; since then we have doubled in numbers. Wars over water and land are going to be the experience of most quite soon. Plus no bees and no clean water. Which is no reason to build walls around our shores, because we are all one species, islands will sink and shores erode. Wars, or stop breeding as we have done? It is too late. What are the whales doing right,.. everything. What are the whales doing? Trying to avoid us mad f#ckers. How many pregnant females were slaughtered this time by the Japanese? I think we here in oz are now responsible for the extinction of 58 species since cook & co arrived not to mention our utter cruelty in accepting indefinite detention plus restricting/denying medical assistance. Onward we march intent on creating hell on earth. What an intelligent, compassionate mob of pricks we are. That you, Leo Jai, survived relatively intact shows there can still be hope for us miserable shits to stand on our hind legs and say no more. Leo Jai, I’ve now bought your book (even though I don’t like buying anything through Amazon) and have put it onto my to-read pile. This sixth wave of extinction is the sixth in the history of life on Earth. The extinction of the dinosaurs was just the most recent. – Late Devonian, 375 million years ago, 75% of species lost. – End Permian, 251 million years ago, 96% of species lost. – End Triassic, 200 million years ago, 80% of species lost. – End Cretaceous, 66 million years ago, 76% of all species lost, including most of the dinosaurs. While hominids parted from other apes around 2 million years ago, our particular species, Homo sapiens, is only about 250,000 years old, perhaps even less. Considering that incredibly short period, we have turned out to be a uniquely destructive species. Josephus, sorry, but you’re wrong. Medicine has actually helped reduce birth rates, and wars and disease increase them. Improving people’s lives decreases their tendency to breed; increasing misery and uncertainty causes them to breed more. The best thing we can do to head-off the population problem is to increase the well-being of the poorest people in the world, and we are managing to do exactly that. That’s rapidly reducing birthrates towards a point where it will be below replacement levels, some time in the next few decades — hopefully sooner rather than later. After that, the world’s human population will slowly decline to more sane numbers. It is far from too late. If history has taught us anything, it is that we can accomplish truly extraordinary things when we want to. We just have to want to. And indications are that we do now, in very large numbers, want to save our planet. Our governments now have become a major blockage to getting the right things done. But this will change. All the money in the world can’t elect a government from a hostile population. The sixth extinction is but a symptom of civilization. Too many humans consuming too many resources has lead to this problem. Very little has been done to address this issue and the end result will be dire. Miriam, sorry, but your wrong. The planet does not need saving, civilization does. Species extinction, pollution, overpopulation, climate change, etc, are all symptoms of civilization and hardly anything is being done to solve these problems. If climate change cannot be solved https://phys.org/news/2017-01-renewables-paris-climate-goals.html then there is little hope that the sixth extinction will be stopped. Species extinction, pollution, climate change, and other problems are being attacked vigorously… just not by our politicians yet. We, the ordinary people are leading the way. We force politicians and corporations to back off from hugely destructive ventures. We invest in renewable energy when politicians still want the worst of the worst energy sources. We buy up and preserve bushland, we plant native trees in gardens to feed native animals. Each person alone feels almost powerless, but when millions of us organise, we can accomplish extraordinary things. Adani had paid off all the right politicians and their Carmichael coal mine was unstoppable some years ago, except we have stopped it. Every time they try a different strategy we block it. We forced the QLD Labor government to make a last-minute reversal of their decision to allow billions of dollars in public funds to be spent on it when they realised they wouldn’t be re-elected unless they publicly backed away from it. The biggest danger is the insidious lie that we have no power and that it will all go wrong no matter what we do. We have enormous power. We just need to discard pessimism and fix things. It works, and it is working. Maybe, in the end, all our efforts won’t fix climate change in time to prevent terrible repercussions, but if we give up because the pessimists convince us that all is lost, then we can guarantee it will never be fixed. We MUST try. * manufacturing materials out of thin air, the way plants do, building things (sugar, starch, cellulose, lignin, oil, wax, plastic) out of carbon dioxide and water has the potential to pull vast quantities of carbon dioxide out of the air and rebalance the climate. * Underground buildings conserve terrific amounts of energy and leave the surface for other uses, for example parks and bushland. * Vat-grown foods can deliver nutritious meat and other foods without devastating the world’s ecologies (Memphis Meats are pioneering this). * Mining the asteroids can free our planet from the destructiveness of mining, and many companies are currently in a race to do exactly that. By all means give up and go cry in your coffee bemoaning the end of civilisation (though I suspect you are privately delighted at the prospect), but some of us are working hard to fix those problems. No the population problem has not been solved at all. Humanity is in overshoot by billions of people, the (sustainable) carrying capacity of humans on planet earth should be around preindustrial civilization population levels. Global civilization has consumed too much of other animals/organisms habitats and resources, leading to the sixth extinction. There is a certain level of life that the earth can sustain and the more humans there are the less of everything else there is. Climate change cannot be fixed with more consumption, this is lost on most people such as yourself. Building out the infrastructure needed to run civilization on renewables would require enormous amounts of resources to be consumed, adding to the very problem it is meant to solve. Renewable energy requires non renewable resources to be built, this makes it unsustainable and not a solution. When a working commercial scale project is pulling vast quantities of carbon out of the air it will be already too late. Vat grown food for millions of people, that’s not sustainable, nature already has the perfect way to grow food. Mining asteroids on a commercial scale is not going to happen, the energy needed to do such a thing makes the value of the resource too expensive to be economically feasible. Rapideffect, you’re arguing against a meaning not intended. When I said the population problem has been solved, you know I meant population increase — birthrate. I already said total number of people will be high until it starts to decrease in the coming decades. It’s dishonest to argue against something not meant… especially when I’m sure you know I’m unhappy with the numbers of people and will be very glad when the start to reduce. But what would you propose we do about it, Rapideffect? Sit there and cry and whinge? You say, “Climate change cannot be fixed with more consumption, this is lost on most people such as yourself.” That’s an odd thing to say. I don’t, and never have suggested we consume more. I spend about $30 a week on food, eat one meal a day, one protein meal a week, produce so little garbage I put the garbage bin out once every 2 or 3 months, and the recycling bin out just 2 or 3 times a year. (I consider that still too much.) I never buy new clothes. I never eat out. I’m always looking for more ways to reduce my footprint. My current computer is trying to die after many years of use, despite me resurrecting it many times. Yesterday I bought a Raspberry Pi 3B+ which will use a tiny fraction of the electricity of my present standard desktop monster. The Raspberry Pi is a desktop computer about the size of a pack of cards. It is built using hardly any resources, will be far more efficient to run than my existing desktop computer, requiring a bare trickle of energy, and I expect it to have a much longer lifetime because of the technology it uses. I am constantly being given dead computers by people, which I get working again and give to other people to save them the expense of buying new computers and to stop the machines ending up in the landfill. How do you improve the world? You say, “When a working commercial scale project is pulling vast quantities of carbon out of the air it will be already too late.” Yeah? Where’s your evidence? Or do you just think that’s so? I actually hope that we’ll have distributed production of materials soon, so everybody has their own device making stuff out of CO2. That would be far more effective than any centralised system. Have you heard of polylactic acid (PLA)? It is a plastic that’s made out of starch, so it is already manufactured indirectly from the air. If left in a damp place bacteria eat it as food. You say, “Underground buildings — caves.” Oh, what an eloquent dismissal. Idiot! Underground buildings save greatly on physical resources and energy use, while doubling the use of your land, effectively giving you that resource back. You say, “Vat grown food for millions of people, that’s not sustainable…” No? Where’s your evidence? Or again do you just think so? (Manned flight? Not possible. Hah!) Vegemite, Marmite, tofu, cheese, yoghurt… yeah, I know the last 3 are made from traditionally grown sources, but they still illustrate the use of vat-production of food for millions of people. And vat-grown meat is expected to be widely available by the end of this year. (It’s already available, but limited quantities make the price far too high for most people. Rapid scaling up of production is bringing those prices down.) That will free up land from cattle and stop the pressure on much of the world’s forests and ecosystems. You say, “Mining asteroids on a commercial scale is not going to happen, the energy needed to do such a thing makes the value of the resource too expensive to be economically feasible.” Oh, knowledgeable one, perhaps impart your wisdom to all those companies racing toward mining the asteroids. One iron/nickel asteroid would be worth more than all the money on Earth. Without oxygen the metal is virtually pure. And then there are all the asteroids that contain vast amounts of water ice. And don’t forget all those expensive, rare materials that are currently mined from the site of old meteorite impacts. SpaceX’s reusable rockets have already brought the cost of space travel down to a fraction of the previous cost, but when (not ‘if’) we get the space elevator, space travel will be extremely cheap. So, with your eyes firmly fixed on the past and cheering for civilisation’s collapse, have you got anything of actual worth to tell us? No. I didn’t think so. Little can be done about it as people such as yourself believe it will sort it self out and everything will be just fine. Unless overpopulation gets the same kind of exposure that climate change does than this serious issue will not be addressed. I wasn’t referring to your own personal consumption. I don’t own any electrical devices, as I only use electricity at my neighbours house to use their computer. I don’t buy any food as I grow all my own. My house was built with materials sourced from my block of land, although some materials were purchased and brought to build the house. I don’t own a car, don’t drink, don’t smoke, don’t use plastic bags, don’t eat fast food, don’t drink softdrinks. Living frugally would benefit the consumption problem, but who would be willing to give up all the modern conveniences. The global economy would collapse if everyone in the developed world lived frugally. Make it sustainable for all life. I was referring mainly to the meat, but commercial produced vat grown food is not sustainable. I never said it’s not possible to do, as you have assumed I said. This is the consumption that you continue to promote as some kind of solution. Many companies spend billions in failed projects, Tesla is heading towards a failed project anytime now. Bringing resources from space to earth in vast quantities is nonsense. The cost of space travel is only part of the problem, the fossil fuels needed would be better of left in the ground. Space elevators are a long long way off if ever. I’m not cheering for civilization’s collapse at all, just pointing out the fact it is on the verge of collapse and no techno solution can fix it. Renewable energy is not displacing fossil fuels anywhere near the pace it needs to halt climate change. Climate change is only getting worse, even with all the so called solutions. If little is being done for climate change than you can be fairly sure that next to nothing will be done about the six extinction. Climate change is getting worse. “The so called solutions” are not being realised. There are few governments that are meeting their Paris commitments. Australia and the US lead the way in insuffient action; in fact, rather than emissions going down in Australia they have been going up. One irony is that with a reduction in aerosols derived from fossil fuel use, the atmosphere is likely to become warmer for a time. This is something I saw recently. I am not saying climate change is to blame. For any farmer having this problem would be a major headache.